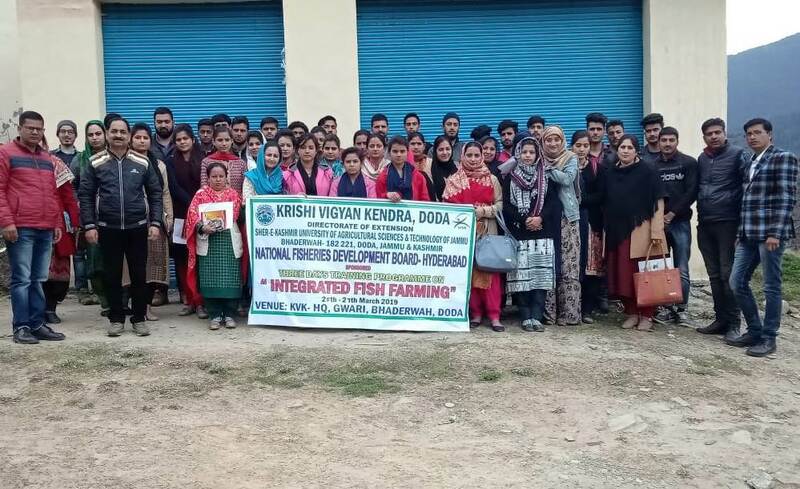 Doda, March 25: Three days ‘NFDB-Hyderabad’ sponsored training programme on “Integrated Fish Farming” for the youths/fish farmers of district Doda inaugurated today at KVK-HQ at Bhaderwah, under the guidance of Directorate of Extension Education, SKUAST-J with the aim to attract more rural youths towards this economic venture. There were total of 50 participants of all category representing more female candidates. The programme was inaugurated by Dr. AS Charak, Sr. Scientist & Head, KVK-Doda in the presence of the officer from Department of Fisheries, Govt. of J&K and the KVK-Scientists. Dr. Charak explained about KVK activities and its mandates. He also briefed about the importance of this NFDB sponsored training programme. Mr. Ganesh Sharma, Department of Fisheries, Govt. of J&K delivered his lecture on various fisheries topics and Fisheries Department’s activities & the state Govt. supports for the fish farmers, etc. Dr. GN Jha, Course Coordinator & Fisheries-Scientist, KVK-Doda showed them how different agricultural crops can be integrated with fish farming. He also explained that any chemical fertilizers, herbicides and pesticides should be avoided nearby the fish pond. Dr. Jha covered various important topics like Importance and economic benefits of fish farming, Types of fish farming practices, Construction of fish farm, various types of Integrated fish farming practices, etc. He delivered a very interactive & informative talk and training to the participants. Dr. Narinder Paul, Scientist KVK-Doda explained the importance of fish farmer’s club formation for starting any new venture in group manner. He also explained how to prepare a bankable project and explained about NABARD schemes for fish farmers. Dr. Paul at the end explained various NFDB schemes for fish farmers and given some task to the participant to prepare NFDB projects. The farmers/youth raised several queries and showed their best interest in the lecture. The daylong activity was ended with an interactive session and vote of thanks by Dr. Charak. Previous articleCong more dangerous than BJP: Akbar.